WELCOME to Premier Massage, where we have been providing exceptional service to clients since 2001. Massage was once viewed as a luxury only afforded to the wealthy. Today, when carried out by a professionally-trained therapist, massage is accepted as a highly effective treatment plan for the relief of a broad array of physical and psychological conditions. At Premier Massage, we strongly believe in the benefits of natural healing, and avoid the use of toxic creams and oils. Because we respect that our clients have busy lives, we maintain a tight schedule and begin all appointments on time. This is your time to focus on you and discover what you have been missing. Therapeutic massage restores balance to both the mind and body. When properly administered, massage releases chronic muscular tension and pain, increases circulation, mental clarity, and joint flexibility, reduces mental and physical fatigue, improves muscle and skin tone, and ultimately strengthens the immune system. Fill out the contact form or call today to schedule an appointment to improve your life naturally. Many of our patients have experienced long-term improvement for conditions such as anxiety, headaches, and insomnia. We have expertly treated fibromyalgia, arthritis/joint pain, soft tissue injuries/pain, and digestive disorders with remarkable results, and encourage anyone suffering with automobile, work, or sports related injuries to set up an appointment to discuss treatment options. Whether you seek a drug-free alternative for a chronic condition, wish to enhance conventional medical treatment you are currently receiving, or could simply benefit from relaxation, at Premier Massage we will adapt our techniques to your personal needs and help you discover lasting relief whatever your situation. With this massage, we reach the deepest layers of the muscles, connective tissue (fascia), and tendons, breaking down adhesions (which cause pain, inflammation, and limited motion in the joints and muscles). Premier Massage offers a wide variety of massage pricing for any budget and FREE consultations!! We also offer membership plans and packages for different occasions: Valentine’s day, Mother’s day, birthdays, etc. Looking for a truly personal gift? 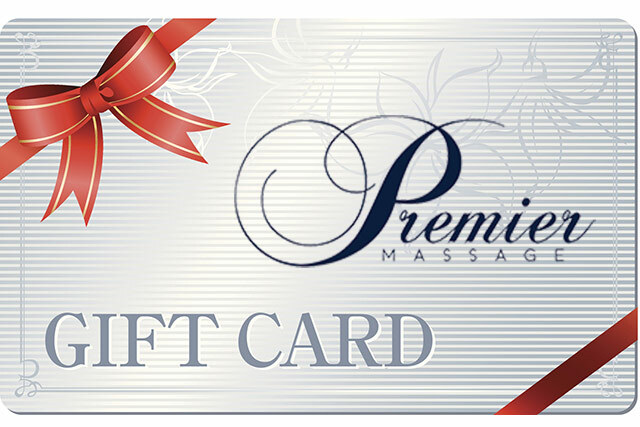 Premier Massage gift cards allow the recipient to choose which of our massage services or products best suits him or her. Our gift cards are available in any dollar amount.